Nose: The first hints of fresh almond and harvest aromas immediately open up into preserved lemon and dried fruits, the whole rounded off by darer smoky and toasted qualities. Palate: The presence of the wine on the palate is immediately captivating. Paradoxically concentrated yet creamy, it is energetic and warm in the mouth, focusing on the fruit, then gradually taking on more profound bass notes. The whole holds its note perfectly, intensively, with just a subtle, elegant hint of underlying bitterness. A rich and smoky Champagne in a graceful package, with a beautiful, fine-grained texture to it and layers of flavor-biscuit, candied lemon peel, coffee liqueur, chamomile, pine, crystallized honey and wood smoke. 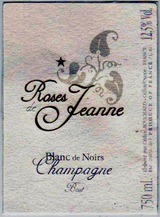 This is the haute couture of the Champagne world-all about elegance, texture and attention to detail. Drink now through 2027.